When I first got to know that we have to move to Sweden as expats, I opened up the map to check the coordinates. It was a difficult decision for us as a family with an infant. Nevertheless, we did decide to relocate. I distinctly recall the day we moved. It was early October, and temperatures were hovering around 10 degrees. I instantly felt the need of a warm coat. (And warm bear hugs from my family. I still miss them as much). As I settled in the country, I started realizing how different it was from my own country. First and foremost, what everyone knows is the weather. My first winter was spend dragging a barnvagen (pram) to and from superstores, play areas etc, in knee deep snow at -25 degrees. Yes, that was the worst winter Stockholm had seen since a few decades. So I would presume that was a way to welcome me? I spent 6 winters in the country, and it slowly got better. Two winters down the line, with Canada Goose and Timberland boots, a job in hand, handful of lovely friends, and I fell in love with the goodest country on the planet. Well, I can write pages talking about my days in Sweden, about snow, about northern lights, about the archipelago, about the royal family, about fika, about kanelbulle. There are various life’s lessons I picked up there. They are not theoretical, but they are practical. I lived them everyday. One is the importance of equal rights for every living being irrespective of gender, race, age, physical capability and appearance, wealth, etc. Secondly, how to maintain a healthy work life balance. I can find several posts on how to have the right work life balance, but till the time the system doesn’t allow you to, it is next to impossible. Having a year and a half of parental leave (divided equally amongst both parents), flexi hours to allow you pick and drop your child at day-care, mandatory lunch and coffee breaks, no emails/ responses expected once the system is switched off at 4pm, no emails/ calls no matter how urgent are not to be attended during vacations (can be upto 6-8 weeks long), and the list can go on and on. 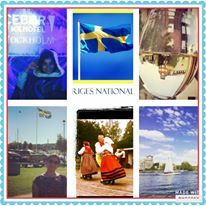 But why I am writing all this here is because there is are two very basic life lessons I learnt there, and these are all what you don’t know about Sweden. Once they decide to go the family way, children form the utmost priority of the parents life. For the next 18 years of their lives, they are parents, and nothing else. Their life revolves around their kid. It is pretty similar to what we feel in other parts of the world as well, but the difference is the way they are being brought up. A 4 month old infant starts sleeping in his own room with a bed alarm. I have seen one of my friend’s put her bed right next to the door outside her kids bedroom, but not next to the kids bed. This enables the child to be independent, and it is true. Similarly, a year old kid is not fed. They eat by themselves. They are not helped while dressing up. They wear their snowsuits by themselves. It is not that they are left on their own, but the very patient parent just stands next to the kid and waits for him to eat/get ready/walk/bike/read/play, but everything on their own. Along with parents, the society has a similar set up. All train stations are pram friendly and all cafes are child friendly. There could be several posts I can write about this point, and anecdotes associated with it. Saving it for a later date. Exercise is like brushing your teeth, it needs to be done regularly without fail. Nothing is more important than giving your body time to relax and muscles to loosen. It can be done by running, walking, swimming, gyming, dancing, playing ice hockey (can be at any ungodly hour, say 11pm or during the lunch break), playing soccer etc. It is ok to change into your tracks and go out for a run during the lunch break. My company had a 5 kms walking path/ map put up in the common room for runners and walkers to follow. Every company also needs to have a couple of locker rooms for employees who come to office running and need to shower before work, or employees who go for walks during lunch, and need to freshen up before starting work. Eating healthy is a norm, a custom. Children have a banana or an apple when they are picked up from school (I am stunned when I see school kids here in England, drinking diet coke in the morning, handed over chocolate bars (ok, those fake energy bars) post swimming, kids munching on crisps). It is a common to spend 5 minutes cutting fresh salad for lunch during work hours. Or to blend a quick smoothie with fresh Kale leaves and yoghurt during working hours. Fruits and salad is sponsored by all companies. I consider myself lucky to have lived in a country full of love, happiness and well-being. A country which taught me the value of life, how precious is this gift from God, and how to treasure it. This post has been written for BAR-A-THON by Blog-A-Rhythm. Great way of describing the life in Sweden!! Sometimes we forget the good things we have around us…. Was refreshing to read this post. I am glad I came across this post. It is not common to come across written material about Sweden. Thanks for letting us know about the country. regarding the first point where parents wait patiently for the kids to do their work by themselves, i guess this is the function of that the parents are not stressed enough in other aspects of their lives. And it is really worth appreciation for the country to give immense importance to physical activity and work life balance. Great post. I love the country and I have always heard good things. Your post makes me want to visit it asap. Thanks for this insightful post. Thanks for reading Inderpreet! Oh its a beautiful country. No words can do justice. Oh I fell in love with Sweden over his post. It spoke about all the things that matter to me. It is lovely that the culture of the country would give importance and value to things that matter to the individual who is a big part of the culture. Correct Jai. It is important for the individual as well as the system to identify and nurture the sources of joy for living beings. You may not believe me, but no one begs there, instead they play instruments to earn or sell religious magazines, and for their ease, the government has distributed card readers. If you wish to give money to the entertainer, you don’t need to keep change. Your credit or debit card will do. I’ve always heard great things about Sweden. And your post just adds to the fact that it’s pretty high on my ‘To Visit’ list. Thanks for reading Sid :). Nordics is a must visit, Norway’s Fjords, Sweden’s culture, and Danish cookies – what is it to live without experiencing all of this?